The entire idea of a walking desk is to be able to *work* while walking, not to get a cardio workout. This company has taken a very costly, heavy, noisy manual treadmill, placed it in front of an adjustable-height desk and called it good. This is the worst abomination of the treadmill desk concept we have ever seen, and we've seen some pretty bad ones before. Our advice? Stick with a treadmill base that's truly designed for office work and isn't going to make you sweat, bobble up and down, and induce a bunch of repetitive strain injuries on your neck shoulders, arms and wrists. Most standard items ship within 3-5 business days. In the context of walking while working we have no positive comments to make about this product, none whatsoever. Extremely costly, noise, bouncy (making it hard to type without errors, and ergonomically hideous) and will put you into a cardio heart rate quickly, all of which are not conducive to working while walking. While sold as both a running treadmill and a manual walking treadmill, you want to run, not walk away from the product. It isn’t often that we’d be this harsh about a product we haven’t physically tested in our labs, but in this case a lab test isn’t necessary, and the harshness is well deserved. 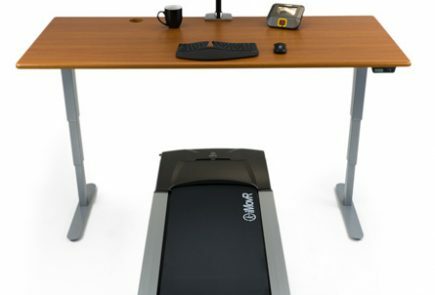 There are a number of companies out there attempting to exploit the booming treadmill desk trend with equipment that’s really designed for running—simply slapping an adjustable-height desk in front of it and marketing it as a “walking desk.” Technically, yes, it’ll let you walk in front of a desk, but a usable treadmill desk it is not. 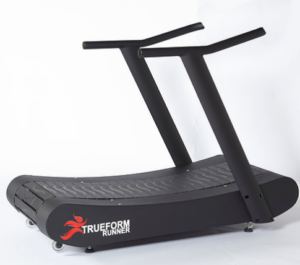 TrueForm has taken this chicanery to a new low, by promoting an extremely expensive, motor-less treadmill with a curved walking track as a walking desk. It is a walking treadmill, indeed, and without a motor, relying solely on your own muscle power, it’ll get into the cardio zone in a heartbeat. 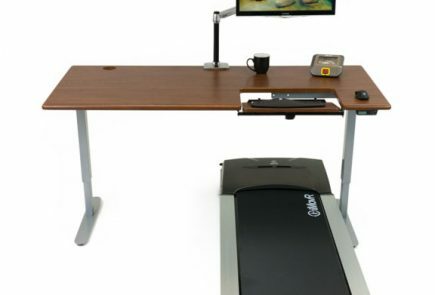 Read more about the differences between a running treadmill and a walking desk. Our advice? Run, don’t walk away from this abomination of a “walking desk” treadmill. Going into cardio will cause you to sweat all over your desk, and degrade your cognitive ability. Forget typing. A curved track like this will cause all your neck, shoulder, arm, hand and wrist muscles to strain trying to hold your fingers in position over the keyboard. We’re talking major RSI (repetitive strain injury) potential here. And good luck trying to think with the noise this kind of treadmill will generate, while your brain has to focus on just walking. The benefit of a true, motorized office treadmill is that your brain doesn’t have to think about walking, enabling greater focus and concentration (i.e. higher blood flow and oxygen supply to the brain). Don’t even get us started on safety issues. 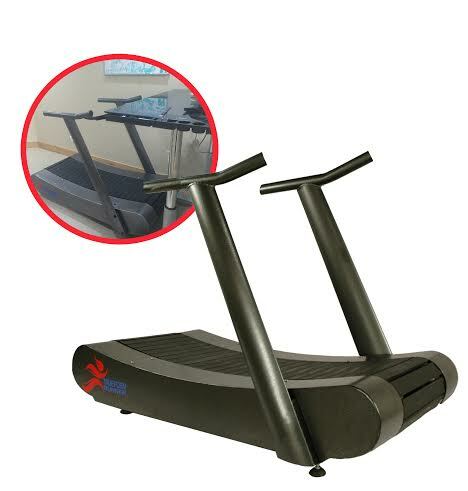 The promoters of this product, which include a famous fitness blogger that has literally declared the TrueForm Walking Desk “the treadmill desk of the year,” (sputter, cough, gasp) have ZERO understanding of walking desk ergonomics. Clearly this product was not UL certified for use with a desk as it would never pass regulatory requirements as such, creating a potential product liability nightmare. Their scant marketing materials make it clear that they have no ergonomic expertise whatsoever, and to our minds, cross the line in making unsupported claims of health benefits (some would call this false advertising, but we’re trying to restrain our outrage and disbelief). If your goal is to get cardio exercise while watching Netflix, and you have $5,695 just burning a hole in your pocket, go for it. But our advice is to stick with treadmills that were designed to maintain NEAT (Non-Exercise Activity Thermogenesis) movement—that are conducive to typing and talking while walking—and hit the gym for real cardio exercise. 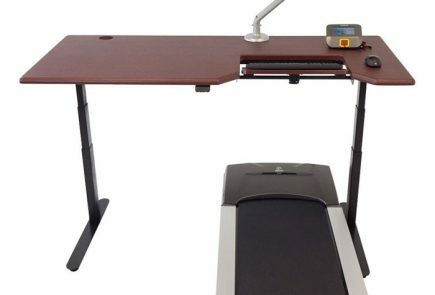 To read about real treadmill desk options check out our comprehensive Treadmill Desk Comparison Review. To keep abreast of all new office fitness equipment please subscribe to our free newsletter.